Let's be clear, the focus of input device reviews on ASE Labs always focuses on the usability and overall feel of the device. We only pay attention to the extras as an afterthought and never as a deciding factor. Input devices are the most important thing you can buy for a computer. You want the best possible products for your needs. You only get one set of hands. Treat them well. The G110 is a good keyboard. We didn't find any problems in daily use for a few weeks. The keys have a subdued feeling and don't make any click sound when depressed. The keys aren't hard to press and they spring back easily enough. We have no problem with the typing speed of this keyboard. In addition, the spacebar was clickable along the entire bar. The G19 had a problem that caused the spacebar to get stuck when clicking on the edge. This is not the case with the G110. Each key is concave to give your fingers a tactile response for the center of the key. Touch typing is great with this keyboard. The G15 was a favorite around these parts, but the G110 has replaced it. It is smaller, feels more tight, and performs well. Logitech includes profiler software for use with this keyboard. We tested it on Windows XP which worked fine. The profiler loaded up about 150 gaming profiles for using with specific games. You can also setup your own macros and backlighting colors on the board. One of the features touted by the keyboard was that you can take your profiles with you. We couldn't figure out how to keep the coloring without using the profiler, nor did the marcos function without a profiler running. Logitech should think about taking the logic out of the OS and putting it into the keyboard. You should be able to set the macros on the keyboard itself as well as the backlight coloring. The settings should stay with the keyboard and not have to rely on a program running. For more intense uses, such as per application profiles, the application can take over the brunt of the work. This leads us to the use in Linux. We were able to get the G macro keys functioning in Linux using the libg15 (compiled with a patch), but we couldn't change the backlight color from the default. It is a subdued blue color. We wanted to have it default to red. Even after setting the keyboard on red on a Windows machine and moving it, it still didn't work. Logitech should provide some type of documentation to allow someone to write a simple driver to control the keyboard. We see no harm in giving this information out, but Logitech didn't want to comment on unsupported operating systems. Other than the backlight, the keyboard does work in Linux, including the macro keys. The USB sound card also works fine in Linux. It was picked up as a generic USB sound device. Unlike the G19, the G110 only has support for a red and blue color pallet. You are stuck with red, blue, or a shade of purple. It is still nicer than having to pick a single color, though. The Editor-in-Chief strikes again in this video review. The review shows off the different coloring support for the keyboard. Please check it out. The Logitech G110 retails for about $70 (Amazon Link, Newegg Link) at the time of posting. At ASE Labs, we always say that inputs devices are extremely important. While we love the G110, you need to try it for yourself. Everyone is different so go to a retail store and try it out before buying it. That being said, the G110 is an excellent product from Logitech. It more than replaces the G11 and is much more than the G19 without the LCD. If you already have a G15 or G11, you'll probably want to stick with that. The G110 does add some nice things. The added USB sound card is a huge plus and we hope that other peripheral makers follow suit. Once games start to really use a dedicated sound card for voice chat, console voice chat will have nothing over the PC. We see a good trend here, Logitech. The keyboard feels good and it doesn't hinder daily performance. It has enough macro keys for most gamers and the layout is standard. We would like to see documentation on how to interact with the keyboard. This is up to you, Logitech. All put together, the G110 is an excellent product and a worthy addition to the G series product line from Logitech. We recommend it. 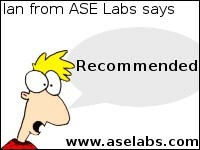 ASE Labs would like to thank Logitech for making this review possible.